Christmas, Hanukkah and Kwanzaa have come early this year for musical lovers because Wicked is back in Los Angeles! If you’ve never heard the story of Dorothy, Glinda and the Wizard of Oz from the Wicked Witch’s perspective, now’s your chance. The Emmy and Grammy award-winning musical will be at the Hollywood Pantages Theatre from December 10, 2014 to March 15, 2015. And since broomsticks are unfortunately not a viable form of transportation outside of the Land of Oz, Metro is the best way to fly to Hollywood. 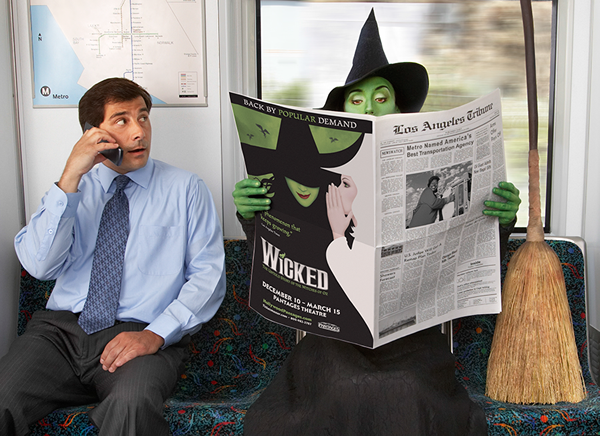 Plus, Metro riders can save $10 on tickets to Tuesday night performances with our exclusive Wicked destination discount. The Pantages Theatre is located at 6233 Hollywood Boulevard in the heart of Hollywood. To arrive via Metro, take the Red Line to Hollywood/Vine Station and simply walk across the street. Metro Rapid 780 or buses 180/181, 212/312, 217, and 222 also stop at theatre at Argyle Avenue and Hollywood Blvd.